#DesignforMSK is the finale to the NIHR Manchester Musculoskeletal Biomedical Research Unit (BRU)’s public and patient engagement work. The project brings young people aged 16-26 with musculoskeletal conditions together with designers to create prototype products that could improve their daily lives and will be curated into an exhibition at Manchester Art Gallery. 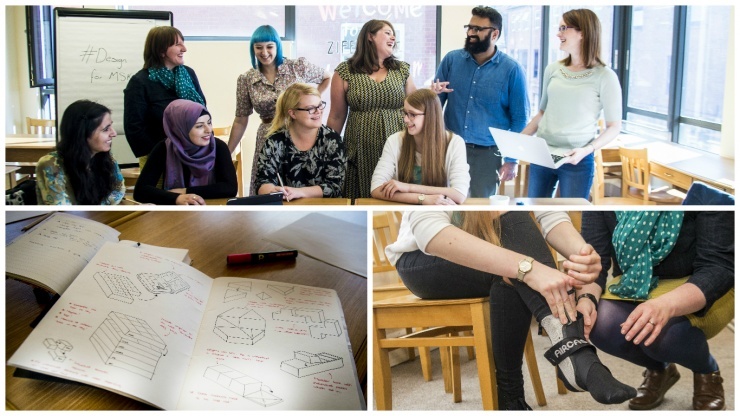 Over a series of three workshops held in Manchester’s Northern Quarter the #DesignforMSK participants worked together to share their ideas and expertise to develop ideas for products that could help people with musculoskeletal conditions. From adaptable bag straps and fashion-statement joint supports to a set of musculoskeletal emojis, the creativity will cross a wide range of design disciplines. The final prototypes will be brought together in a curated exhibition, #DesignforMSK: the Invisible (Visible), to be held at Manchester Art Gallery from the 5th – 8th December 2016. As well as producing prototypes of products that have potential to be taken forward with real-world applications, #DesignforMSK has had a personal impact on the participants. For some, taking part in the project was the first time they have met other people their own age with similar conditions to themselves, and many plan to stay in touch once the project has finished. This project was funded by the NIHR Manchester Musculoskeletal Biomedical Research Unit and delivered in partnership with the Manchester Metropolitan University and Manchester School of Art.